Catch us downtown in Riverfront Park with 3 other food truck friends for some tasty lunch fare! Catch us for lunch at Premera Blue Cross ( 3900 E Sprague Ave, Spokane, WA 99202). OPEN TO THE PUBLIC! Come enjoy lunch with us in Liberty Lake! Catch us downtown in Riverfront Park with 5 other food truck friends for some tasty lunch fare! Catch us downtown in Riverfront Park with 5 other food truck friends for some tasting lunch fare! Join us and our friends for a rally at the funky Perry Street Fair. Participating trucks are Jamaican Jerk Pan, Skewers, Mixed Plate, One Night Stand BBQ, Tacos Tijuana, Black Fire Kettle Corn and Sweet Annie’s Ice Cream. 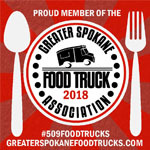 Join us and our other food truck friends from the Greater Spokane Food Truck Association at Kendall Yards Night Market for their monthly food truck rally! Join us, Meltz Extreme Grilled Cheese, Mixed Plate Food Truck, Mac Daddy's Gourmet Grub, Skewers, Christ Kitchen, Tacos Tijuana, One Night Stand BBQ, Black Fire Kettle Corn, and The Scoop for CDA's biggest food truck rally in city park. Beer garden provided by Selkirk Abbey with a portion of the proceeds benefiting Newby-Ginnings. Come see us at this weekly event! For more information please visit the below site. There will be six food trucks here to satisfy all your needs while you shop the local farmer's goods. 3 Ninjas, The Bistro Box, Nick's Shameless Sausages, Tacos Camargo, and The Scoop! We are one of a select few serving at this local musiclovers event. Live music for three days straight! ElkfestSpokane.com for more details and musical lineup. Join Northwest Harvest on Thursday night, June 2nd for the 3rd annual Crush Hunger event. This event is a fun and unique spin on a traditional wine tasting! We hold this event in the EAA Hangar at Felts Field in Spokane. The hangar door is open and the party flows out onto the tarmac. Local food trucks are parked just beyond the hangar door for you eating enjoyment! Beer enthusiasts need not worry - we have some great beer for you to drink too! Watch the sunset on the runway while tasting great wine, eating great food, enjoying a live band - all while helping to fight hunger! Thanks to our generous event sponsor, Banner Bank, each $45 ticket helps Northwest Harvest provide 204 meals to local children and families in need. All day, 4/20, we will be serving the patrons of this fine establishment while they celebrate the National Stoners Holiday. We will be serving the patrons of Deck-Spo, a sales event with the lowest decking prices of the season on East Francis at Country Homes Supply.